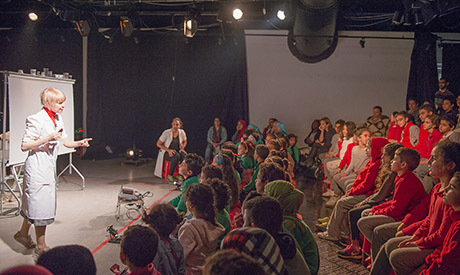 The seventh edition of the Hakawy International Arts Festival for Children (7-16 March) brought plays and creative activities from Egypt, Germany, the UK and the USA. As is the case each year, while the plays gave the young audience a lot of fun, they also opened their eyes to many issues, triggering thoughts and igniting the imagination. Each play offered something wonderful and unique in its own way, and The Curious Scrapbook of Josephine Bean from the UK was no exception. The award-winning performance was created in 2011 by Shona Reppe, who is also the only actress on stage. Reppe was born to an English mother and a Norwegian father, and she lives close to Edinburgh, Scotland. Though her family had no artists in it, she developed a passion for theatre, particularly children’s theatre. Reppe studied theatre, history of art and English at Glasgow University (1991), earning a postgraduate diploma in stage design at the Welsh College of Drama in Cardiff (1992) and doing summer studies at the London School of Puppetry. In 1996, she founded Shona Reppe Puppets, now known simply as Shona Reppe. The artist’s online biography goes on to enumerate the many shows she has created, most of them – including this one – based on her own original stories. And since a scrapbook can be a very straightforward and flat object for theatre – “a kiss of death”, as Reppe puts it – she had to find a formula that would help her infuse the episodic experience of turning the book’s pages into a vibrant and thought-provoking performance. To do so, the technical side of the story is as impressive as it is complicated. 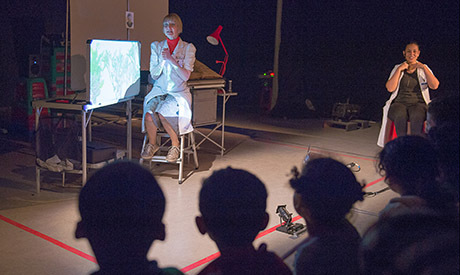 Reppe reveals that the performance’s technical manager, Tamlin Wiltshire, used QLab software to make rapid shifts between the many elements of the show: moving across the soundscape, short animations that reflect Dr. Baker’s study of tiny objects emerging from the scrapbook, lighting that includes the theatre projectors and a table lamp, and even elements of shadow theatre in one scene and a short movie in the final scene. On the investigation table lies a scrapbook, a big, outstanding prop whose magnificence creates is in contrast with the rest of the simple — and obviously easy to transport — scenography representing the laboratory. “I have always been interested in scrapbooks; there is a big culture of scrapbooks particularly in the USA and UK. All the elements that we find in any scrapbook are close to the person who collected them, they all tell his or her unique story.” In this story, we learn that the scrapbook’s owner, Artemis J Mood, is an old man from the Victorian era. The fact that he was a watchmaker was probably behind his particular interest in small things and ability to spot them. Dr. Baker’s investigation also unveils that Artemis traveled a lot to the sea where he collected different kind of seaweeds that he dried and kept in the scrapbook; he smoked a pipe, enjoyed ballet and good food. Not without significance is Artemis’s special heart-shaped sea bean, Fava de Colom or a Columbus Bean, known to bring luck to its owner, or one that can become a foundation for the fantastical developments we find in the play. Most importantly, however, as Dr. Baker keeps turning the scrapbook’s pages, she discovers that Artemis was in love with a very special, somehow magical woman, Josephine Bean. Revealing more details about Miss Bean would be a huge spoiler so let us stop here. In the theatre, Dr. Baker walks the audience through her consecutive discoveries. “Making this show was quite complicated,” Reppe says. “I wanted to be able to lay down some clues without giving too much away. It was a challenge to perform it the way that children would not lose interest. This is why it is mainly for children aged seven and above; they have to be able to remember different elements, connect facts and discoveries. It is like a detective story. When I was writing the script, it was like writing a crime novel. In fact, as I was collecting bits and pieces for the show, I also created my own scrapbook for the show. This helped me create this specific scrapbook that you see on stage,” Reppe explains with her hallmark enthusiasm, the same one she projects as Dr. Baker. The Curious Scrapbook of Josephine Bean delivers many values besides being fun, visually stimulating and aesthetically pleasing. It ignites the imagination and invites children to think. In her investigation, children are not reduced to spectators, they are the “scrapets” whom Dr. Baker expects to be active participants and follow her path of thought. 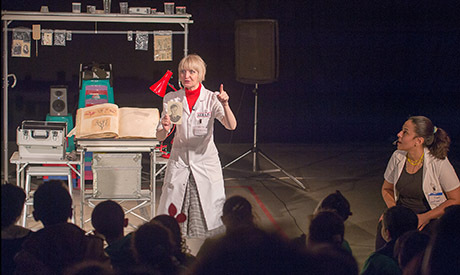 Throughout the show, Dr. Baker repeatedly addresses the audience, explains her scientific procedure of “scrapology” but also awaits the scrapets’ ideas. “It was a bit of a challenge in Cairo since English is not the native language of the audience. In the UK, I can talk more and go deeper into Artemis, Josephine as well as Dr. Baker’s characters. In Cairo, we had to have a translator.” However, in order to avoid a dry translation that would only kill the show, Reppe introduced Dr. Baker’s assistant: Isra Ghazali, an Egyptian actress seated on the stage. While translating the text, Isra also asked Dr. Baker and the young audience questions, raised her eyebrows at some discoveries and rejoiced in others. “I could see the children were very involved. At times they talked in the audience, which I don’t mind, as long as they talk about the performance, which as Isra told me was the case. If my audience talks about something else, this is when I feel I failed to attract them,” Reppe says. Yet with her skills, experience, creativity and captivating disposition on stage, it is no surprise that she kept the audience focused. The intimate setting helps Reppe develop closeness and build trust with the audience, something that is not necessarily a standard procedure in theatre for children. There are many theatre-makers who create barriers simply because they do not trust the children’s abilities to absorb information and emotions. Because they often address children with an abnormal tonality, unnatural sentences, their performances are filled with preaching and direct instructive educational elements (as they believe), among many other procedures that render the children’s plays awkward for the adult viewer. There are performances that attract the audience with their big Hollywood-style elements, loud and vibrant, definitely enjoyable in their own way, even if they don’t create a strong and intimate bond with the audience. There are also theatre-makers and audiences who judge their success based on the children’s laughter during the show. The Curious Scrapbook of Josephine Bean provides a whole range of emotional experience for children. There is time for reflection, for questions and curiosity, time for attentive listening and time for laughter, since the story does include numerous funny moments too. It is the artistic voyage through a story which, just like any life story, includes all shades and colours of emotions and actions. This does not mean that Reppe aims for education through theatre, however. “This is not my primary goal and it’s not about training the audience. But if you want to find educational values, you will probably find them in my plays. My primary goal is always in the performance’s standard. It has to be as high as I can make it.” Reppe believes that children deserve good theatre and is saddened that many artists and artistic institutions consider theatre for children a lesser form.